It's very quick to get a new blog post up on your website. Blog posts can be found under Blog. On the Blog page, any previously added blog posts will be listed. To add a new Blog article, click the green "+ Create Blog Post’ button at the top of the page. Below is an explanation of the fields on the Blog post details page. The title for the blog. It should be short and snappy, but explain what the blog is about. If no blog categories have been set up this field will not appear. The blog categories are used to separate different blogs for example the different year groups in a school, a headteachers blog, or a support staff blog. When adding a new blog post select the blog category the blog belongs to. The date the blog post will will be published as on your website. The blog post will be given the publish date of the date entered here. If this is a date in the future, it will not appear on the website until the publish date. 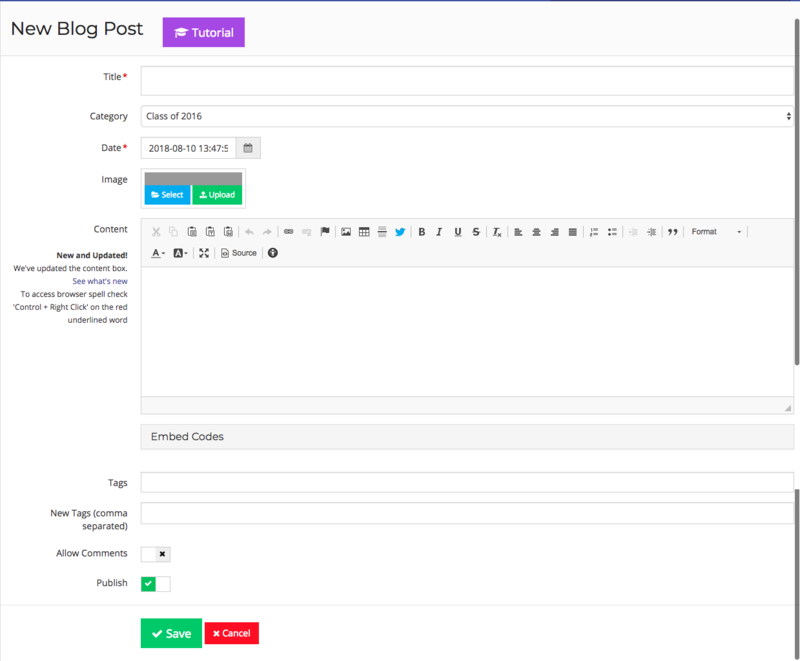 This allows the building up of blog posts that are all ready and will automatically go live on the appropriate date(s). This image is the thumbnail image that appears under the title in the a blog preview, and at the top of the blog post. Ideally it is an image related to the content, having an image for content dramatically increases interest in that content. We recommend use of a landscape image, the system will select the top bit of the image for the square thumbnail preview. This section contains a complete list of all the embed codes you have created. The tags box allows you to categorise and tag your articles. For more on tags click here. To enable comments on your blog post check the comments box and readers will be able to post comments to that particular post. When a comment is added you will see a notification in your Dashboard to approve comments before they go live. The publish checkbox is ticked by default and allows the content to be shown on the site. If the publish checkbox is not ticked the content will not be shown. If the blog is being posted by an 'Editor' user the post will not go live until it has been approved by an 'Administrator'.